Send Unacknowledged (SND.UNA): The sequence number of the first byte of data that has been sent but not yet acknowledged. This marks the first byte of Transmit Category #2; all previous sequence numbers refer to bytes in Transmit Category #1. Send Next (SND.NXT): The sequence number of the next byte of data to be sent to the other device (the server in this case). This marks the first byte of Transmit Category #3. Send Window (SND.WND): The size of the send window. Recall that the window specifies the total number of bytes that any device may have outstanding (unacknowledged) at any one time. Thus, adding the sequence number of the first unacknowledged byte (SND.UNA) and the send window (SND.WND) marks the first byte of Transmit Category #4. This diagram is the same as Figure 207, but shows the TCP send pointers. SND.UNA points to the start of Transmit Category #2, SND.NXT points to the start of Transmit Category #3, and SND.WND is the size of the send window. The size of the usable window can be calculated as shown from those three pointers. This is called the usable window, since it indicates how many bytes the transmitter can use at any point in time. When data is acknowledged, this causes bytes to move from Transmit Category #2 to Category #1, by increasing the value of SND.UNA. Assuming that the send window size doesn't change, this causes the window to slide to the right, permitting more data to be sent. Key Concept: The TCP sliding windows scheme uses three pointers that keep track of which bytes are in each of the four transmit categories. SND.UNA points to the first unacknowledged byte and indicates the start of Transmit Category #2; SND.NXT points to the next byte of data to be sent and marks the start of Transmit Category #3. 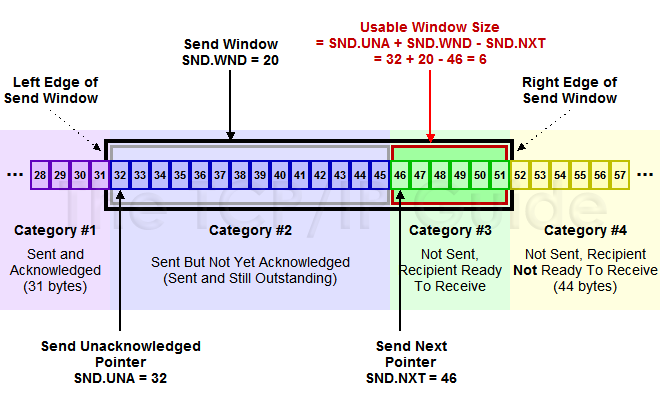 SND.WND contains the size of the send window; it is added to SND.NXT to mark the start of Transmit Category #4. Adding SND.WND to SND.UNA and then subtracting SND.NXT yields the current size of the usable transmit window.